Akron Zips forward Demetrius Treadwell (1) grabs a rebound against the Iowa State Cyclones during the second half of the NCAA basketball game at Stan Sheriff Center. HONOLULU (AP) — Duane Notice scored 15 points as South Carolina defeated Akron 69-59 in the third-place game of the Diamond Head Classic on Wednesday. Sindarius Thornwell, Brenton Williams scored 12 points apiece and Michael Carrera, Tyrone Johnson each added 10 points off the bench for South Carolina (4-6). 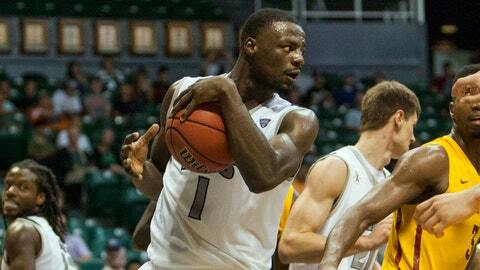 Demetrius Treadwell scored 12 points and Quincy Diggs had 10 for Akron (6-4). The Gamecocks took over midway through the second half. Notice’s basket with 13 minutes remaining started a 14-3 run as South Carolina rallied to take a 53-45 lead. A 3-pointer by Jake Kretzer and a three-point play by Treadwell helped Akron close to 59-56 with 4 minutes remaining. But Notice scored on the next play and then his steal and layup put the Gamecocks ahead 63-56 with 3:19 left. South Carolina then stole the ball on consecutive Akron possessions to seal the win.